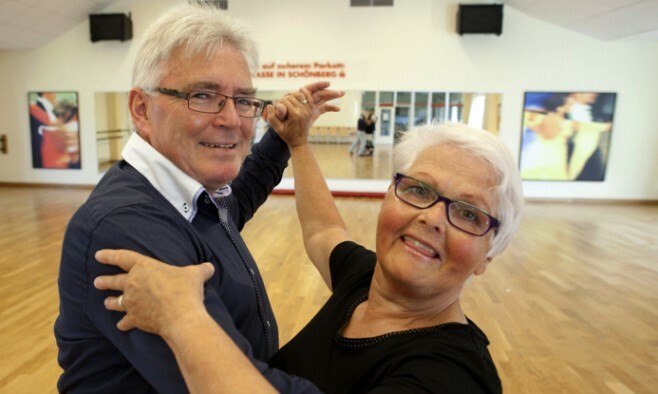 My name is Inge Carstensen, I am 64 years old and since 2003, I have been diagnosed with Parkinson’s disease. I have always loved being a very active person and over the past years I have been working as a competitive dance trainer. My husband and I absolutely lived for ballroom dancing. Being diagnosed with Parkinson’s disease was a terrible shock for both of us. It was actually my husband who recognised the disease from a friend suffering from Parkinson’s, during a holiday in the South of France. However, it took almost two years until I was diagnosed with the disease. Retrospectively, I know now that back then I already showed typical symptoms of Parkinson’s – I began to drag my feet, to walk leaning forward and stopped swinging my arms when walking. Nevertheless, I did not foresee the diagnosis. I must admit that for the first eight weeks after the diagnosis I just cried. I’ve always been a fighter and after eight weeks I put my foot down and decided: “This is it; I will stand my ground and not give up.” However, thinking I was in a very early state of the disease, I didn’t consider myself a candidate for deep brain stimulation. It was my physician Professor Volkmann who first told me that I was the ideal patient for a brain stimulator, so I made the decision to go ahead with the procedure. Afterwards, I went to Würzburg clinic where I met Professor Matthies, the neurosurgeon who was going to carry out the procedure. She took her time to explain everything that was going to happen. I received the best preparation possible! I know that many patients fear the operation but the day of my Vercise DBS surgery was the 12 of December 2012 – and it was my lucky day. How has my life changed since that day? There are a lot of things that are different now: the tremor has gone, I am able to move my left hand normally and all my friends have told me that I look like I’ve found the fountain of youth! Most importantly, I went back to having a normal sleeping habit – that is most important for me. Although I am still slouching, I have also adopted a much better posture. I recently received an encouraging compliment from the patient support group I visit regularly: I was mistaken for a caretaker not for a Parkinson’s patient – a wonderful surprise! Another great relief to me is that thanks to the DBS device, I could reduce the quantity of tablets I had to take before. Now, I have to take only five a day and I simply feel better in every way. I would certainly do the treatment anytime again. I think it is very important to look for a doctor you feel you can trust. The preparation and training I received from the physicians prior to the procedure was excellent and everyone invested a lot of time to explain everything to me. I’m getting along very well with the device itself – it is easy to use and the batteries only need to be recharged every 10 days, at which point I allow myself a break for one and a half hours and spend my time reading or knitting. This article was sponsored by Boston Scientific. The information in this article is given for information purposes only and does not represent an endorsement by the EPDA of any particular treatments, products or companies. This article is not a substitute for advice from your doctor, pharmacist or other healthcare professional. Parkinson’s Life makes no representations or warranties of any kind, express or implied, about the completeness or accuracy of information provided.